‘Notes On Excavating And Writing The Past’ is a storytelling-event on the occasion of the exhibition The End of This Story (And The Beginning of All Others), currently on view at Framer Framed (2015). Two anecdotal and personal stories about traces of history and tracing history, meeting with historians and the legacy of the British archeologist Howard Carter, will be told by partaking artists Kaya Behkalam and Abla elBahrawy, highlighting the subjective, ephemeral and transient nature of history-telling and its methodological complex, thereby undermining vast concepts and master narratives of its discourse. In an intimate setting, the two artists’ stories will be narrated and followed by a discussion between Kaya Behlakam, Abla elBahrawy and the art historian and freelance curator Katayoun Arian. The exhibition The End of This Story (And The Beginning of All Others) challenges prominent modes of historicizing as a credible producer of knowledge. In placing the works of two artists side-by-side, the exhibition both highlights and explores the practice of storytelling, through the presence of the methodological complex of archeology–both literally and metaphorically. Using a dialectical approach, the exhibition serves as a critical footnote to the representation models of ‘The Crisis of History’ trilogy, a series of exhibitions concerned with the crisis of history and how this crisis is felt in the art world, particularly in the Middle East. The exhibition The End of This Story (And The Beginning of All Others) will be open one hour prior to the event, and one hour after. Crisis of History: Fight History, – Strategies of Resistance (2015) is also currently on view at Framer Framed. Both exhibitions are on view till 8th of March 2015. Opening hours: 2 – 10 pm, Wednesday to Sunday. Free entrance. 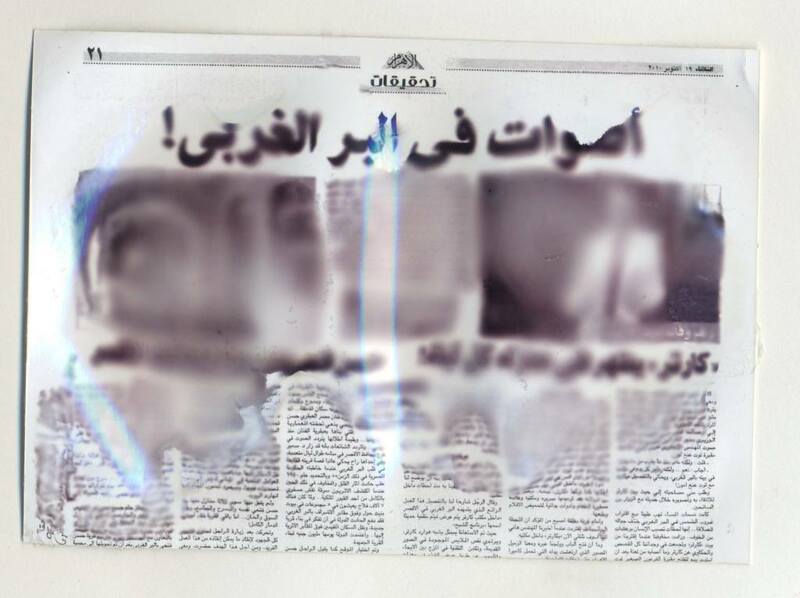 Voices in the West Bank, Article from Al-Ahram news paper, 19 October 2010, a manipulated image from the Palimpsest tests, Abla elBahrawy, 2014.